In 2014, Connolly and iHealth Technologies (CiHT) merged to form an end-to-end payment accuracy services provider with unmatched expertise, technology and analytics capabilities. The company’s leadership team took advantage of the move to introduce a new vision and recast the customer value proposition. Tenet Partners played a strategic role in the evolution, guiding a comprehensive rebranding program to unify the company’s employees, stimulate new demand from clients, and set the stage for future growth. Connolly iHealth Technologies took a carefully considered approach to rebranding the recently merged company, calling in Tenet Partners to uncover its strengths and help craft a strategic action plan. Most conversations about mergers and acquisitions take place between business executives, financial analysts, and lawyers. The emphasis is on the future of the company post-merger. However, equal attention needs to be paid to the brand portfolio, and how to take it to market. There is no lack of positioning options. Management may choose to keep and refresh the legacy brands, or retire them and launch a new one to embody the combined company. For companies in need of an immediate lift in perception, rapid action is critical. But for those already in enviable positions of leadership, as was true for Connolly iHealth Technologies, it’s important to take the time for thorough, strategic thought, research, and planning. Connolly iHealth Technologies management decided to initiate a robust rebranding program in order to help the two predecessor companies identify their strengths, discover new ways to overcome potential weaknesses, and bring together their distinctive business cultures. Taking the time to formulate a robust brand strategy also provided the opportunity to reach out to various constituents—healthcare payers, retail clients, and employees worldwide—and gain actionable insights on existing perceptions and expectations for the future. The first step was discovery—learning all there was to know about how clients and employees saw the combined company. The original value propositions of Connolly and iHealth Technologies were distinct from one another, and management of the merged company believed a single approach was the proper course. This was supported by Tenet’s discovery process, which revealed that stakeholders wanted and expected a cohesive solution to emerge from the combination of the two companies. CiHT management had a vision of how the joined company could create new value for its customers, and wanted to base its decisions in research and sound strategy. Tenet’s findings confirmed what management believed: the combined expertise of Connolly and iHealth Technologies could differentiate the company by unlocking hidden value across the entire payment continuum. In this way, the new organization would be able to help clients achieve greater operational excellence and payment accuracy than either Connolly or iHealth Technologies could individually. The rebranding exploration thus fed into business as well as brand strategies. Strategy work that centered on understanding customer relationships gave CiHT management a clear view into the company’s two teams. By interviewing clients and employees, Tenet mapped the healthcare and retail customer journeys, gaining critical insight into the brand experience from every perspective. The result was a real-world sense of CiHT’s strengths and weaknesses, helping to define shared service principles and aspirations for the new organization. The true value of Connolly and iHealth Technologies sprang from what they shared—expertise and an ethos of service that spread across the merged company. Armed with a deep understanding of CiHT’s expertise, its culture, its clients and the marketplace, Tenet and CiHT teamed up to build a framework for its new brand. The framework was built on the image of a diligent, expert partner, digging into complex customer data in pursuit of one thing: finding and unlocking hidden value. The central idea of ‘unlocking hidden value’ became a touchstone for everything from positioning to brand personality. 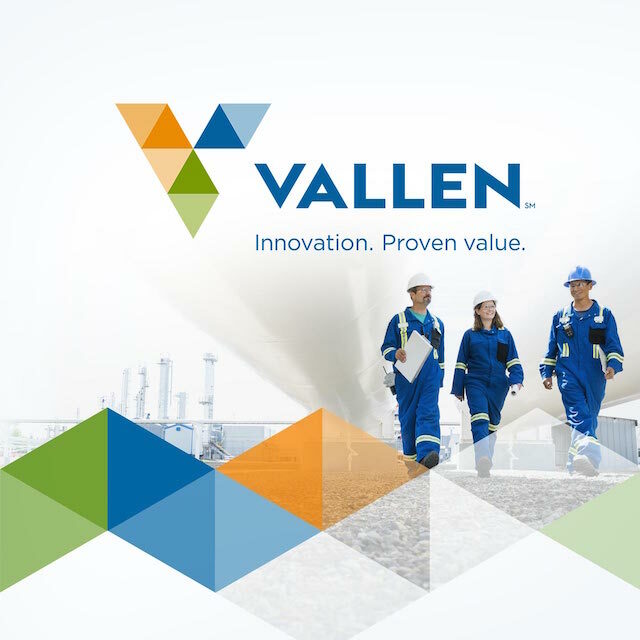 Building on this foundation, the team turned to constructing a brand architecture that would bring employees together, and deliver the clear, joint value proposition clients had been looking for. Tenet’s research also revealed that a new brand name and brand architecture were the best ways to solidify the merger of Connolly and iHealth Technologies. The interim name was healthcare-focused. At the same time, however, the legacy Connolly name and reputation had value for retail clients. It also pointed to the importance of the legacy name, Connolly, and the value that retail clients attached to it and its reputation. Together with CiHT management, Tenet strategists explored a variety of options for the company’s brand architecture. Following Tenet’s recommendation, company management opted for a single master brand, with separate brands for the healthcare and retail businesses. This master- and sub-brand architecture retains the equity of the Connolly name for retail clients, while signaling unification and an overarching strategy for the company as a whole. Tenet’s research findings were also reflected in the name and tagline. Cotiviti represents two ideas that most resonated with clients and employees: collaboration and creativity. The new tagline, ‘Analytics. Insight. Value.’, speaks to how Cotiviti unlocks value through the power of analytics that deliver actionable insights to clients. During development of the verbal and visual brand identity, Tenet’s editorial, design, and digital teams worked closely together. At every stage, Tenet leveraged the strategy work to capture the essence of Cotiviti’s value proposition. The Cotiviti brand voice takes customer engagement in a new direction by bringing out the company’s strategic role in the success of its clients. The visual elements also play an important role in communicating key ideas—elements of the logo and design system evoke the value hidden in client data, the complexity of the client landscape, and the orderliness and rigor of Cotiviti expertise. How employees understand and express the brand’s value is essential. A successful brand is more than the sum of its elements. Strategy, mission, vision, positioning, values, content, and design are all essential, but at its core, every powerful brand depends on delivering the right customer experiences. Equipping and motivating employees to make those experiences real is critical. When asked to describe the number-one reason for the success of Connolly and iHealth Technologies as separate entities, clients and employees spoke of “promises kept.” Both were renowned for their respect for the relationships between clients and their providers. Both delivered an evolving portfolio of creative solutions, and invested teams of payment accuracy experts. But most importantly, both were dedicated to exceptional business results for their clients. These core traits became the core of the Cotiviti brand experience. As part of the original brand strategy work, Tenet had mapped the journeys that clients take as they interact with Cotiviti and its employees. This documented what the company was doing well at relevant touch points, and suggested improvements that could reinforce brand perception and loyalty. By seeing the customer experience in context, management was able to understand how the company’s shared ethos of quality is expressed in the real world. Together with Cotiviti, Tenet strategists used this knowledge to develop service principles that became the ‘Cotiviti Way.’ It is a code of conduct for every Cotiviti employee, creating a signature, customer-focused brand experience delivered through every interaction. With a new platform on which to build, employees could move forward with a single purpose. Since the formation of Connolly iHealth Technologies in 2014, clients and employees had been waiting to see what changes the merger would bring. The management team set clear goals for the rebranding exercise: rally the legacy healthcare and retail teams around a compelling mission, and foster a desire for collaboration across the newly unified organization. Employees, the company, and its customers all stood to benefit from a strong sense of community, common interests, and shared aspirations. To achieve these goals, Tenet led a company-wide employee engagement program, rolling out in stages leading up to the launch date. This gave employees a solid grounding in the new brand’s personality, principles and attributes prior to launch day, when the new name and identity would be revealed for the first time. The program included live training, an internal brand education microsite, and an email campaign. The training program was developed by Tenet and delivered by Cotiviti brand mentors. 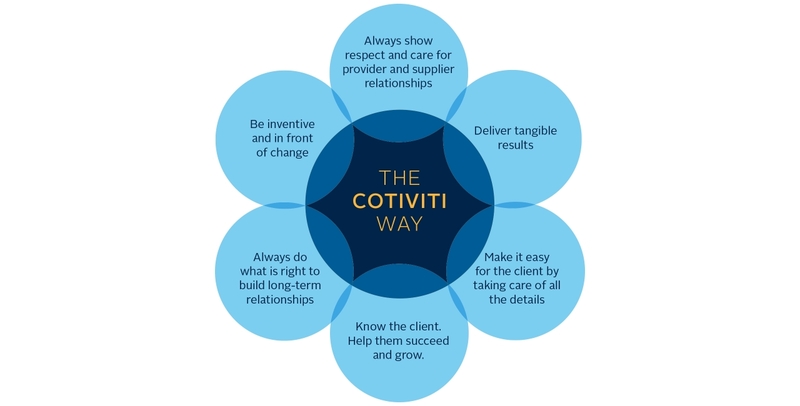 The goal: to generate a deep understanding of the role each employee plays in delivering service the ‘Cotiviti Way,’ and to show how incorporating brand values into every action—‘living the brand’—impacts the company and its clients. This training program was instrumental in shaping behavior and creating common purpose across business units. Tenet built an educational microsite that complemented the live training by educating employees on the importance of the brand experience and how it contributes to business success. 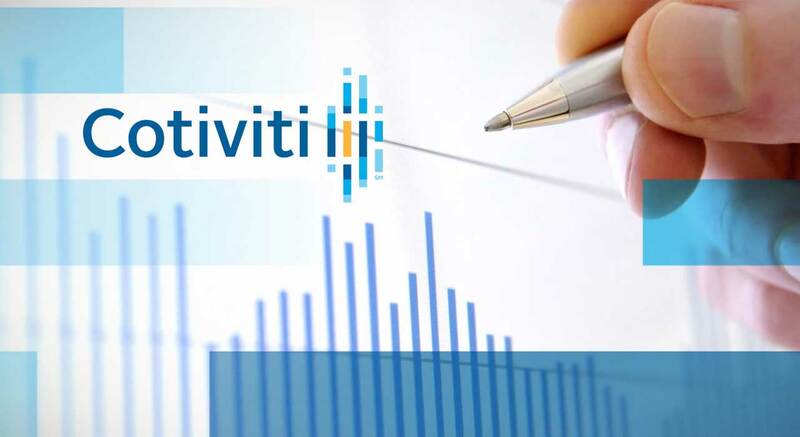 Through interactive games and engaging copy, a clear message was sent: by rebranding, Cotiviti is investing in the future of the company and its employees. The microsite also delivered the vitally important message that The Cotiviti brand cannot stand on its own. The employees themselves, by acting together through consistent, on-brand behavior must nurture it. In this way, employees would be the force that elevates Cotiviti above its competitors to become a distinctive presence in the marketplace. Cotiviti’s microsite, together with a weekly email campaign, prepared employees for the new brand’s launch with clear, consistent answers to likely client questions. This helped to ensure that all key constituents would understand the benefits of the new brand and go-to-market businesses, and what to expect in the future. Launching the new brand gave Cotiviti an opportunity to establish itself as an industry leader with a clear vision for the future. 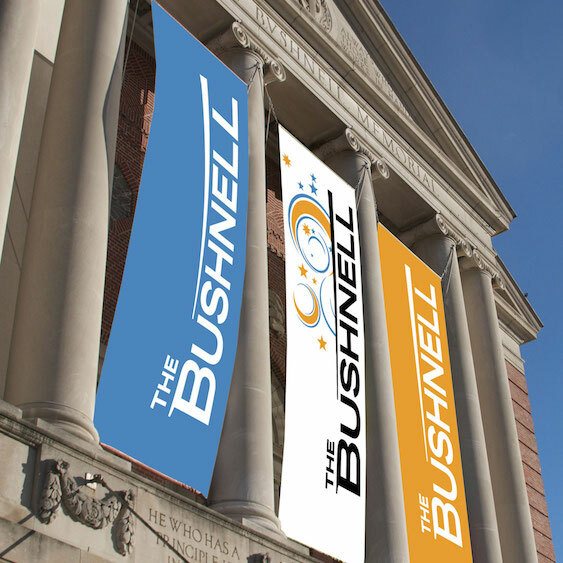 A full rebrand is a rare event, marking the beginning of a new epoch for a company, its employees and its clients. It is a milestone that offers the seldom-seen opportunity to create greater awareness. It signals change and invites people to take a closer look at the company, what it stands for, and what it can do for them. 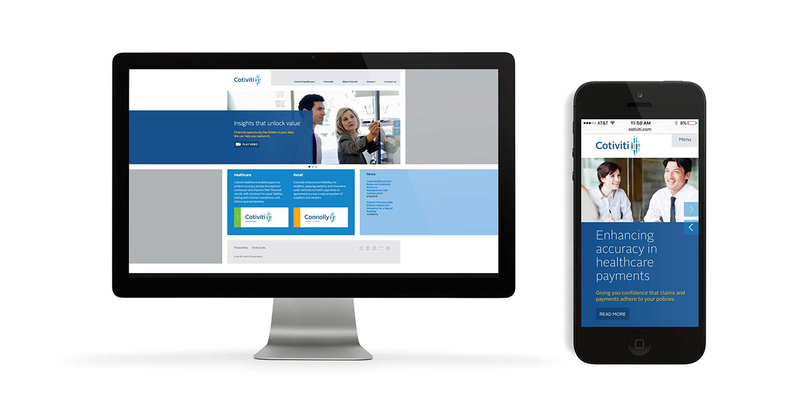 For Cotiviti management, the creation of a new brand was a means to communicate, clearly and assertively, how the merger of the two companies, Connolly and iHealth Technologies, went beyond a simple business transaction. The launch of Cotiviti telegraphed operational excellence and thought leadership—establishing the company as a true leader in payment accuracy. Cotiviti’s trademark attention to detail was evident in the weeks leading up to the new brand launch. The Cotiviti marketing team worked closely with Tenet to orchestrate myriad activities. Tenet designed a comprehensive, multi-channel rollout strategy to drive awareness and excitement across all touch points. A new corporate website and user portals, employee communications, sales enablement tools, video, and additional marketing collateral were all part of the coordinated effort. The successful creation of the Cotiviti brand has given the company what it needed: the means to elevate payment accuracy in the minds of clients, from a back-office business activity to a strategic best practice. And, it sends a clear message of how Cotiviti combines technology, proven expertise, and industry knowledge to unlock value for clients in a way no competitor can.